Christian families who homeschool face constant harassment from local, state, and federal officials. In one of the worst cases out there, parents in Texas had their children taken from them again after they were accused of neglecting their kids. The reality is, however, that they are being targeted by child services. From 2003 to 2005, 118 foster children died in their care, where “compared to the general population, a child is four times more likely to die in the Texas foster care system.” Incredibly, around that same time, 100 children were poisoned and 63 were raped while under state care, including four-year-old twin boys. This time around, an innocent error got their nightmare going all over again. 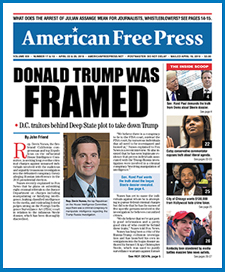 “In May, I went across the street to a coffee shop, and I went out the garage door, and my youngest daughter followed me out the door, but I didn’t know that,” explained William Rembis, in an exclusive interview with AMERICAN FREE PRESS on Sept. 4. DFPS got an emergency removal order and removed all 11 children on Aug. 25. Even the judge from the previous case asked DFPS why they kept harassing the Rembises since there was no evidence of abuse or neglect, no criminal history, no substance abuse—nothing. William believes so-called child protective services entities like DFPS have an agenda, and it’s not the safety of children. “We have a large family, and they get money for every kid they take into custody,” William explained. Claire Rembis thought that after the judge reprimanded DFPS her troubles would be behind her. “As homeschoolers in a large family, we’re very well aware of what’s been happening a lot to Christian, homeschooling families, especially large families,” Claire Rembis told AFP on the same day. When they took the children last year, there were allegations of abuse in the foster care system. “Seven of them were returned within 36 hours, and then the rest came home after a hearing, which was six days later,” Claire explained. “Five children were abused,” she said. “The first one who was abused was my son who was only gone for 36 hours. After he was removed they took him to a homeless shelter in downtown Dallas, where there are other homeless kids and homeless adults. A few hours after he arrived they sent in a psychologist to do some testing. He was with this psychologist for nine hours straight, and one of the things they asked him was whether or not he masturbates.” The son told one of his siblings he was asked that and he didn’t know what it meant. It got worse for Claire and William. “We obtained their medical records, their doctors’ exams, for two of them, and when I was reading through the exams with an attorney, she explained to me that one of the things I was reading was a description of a sexual assault,” she said. Claire’s daughter explained what happened. “She told me the doctor looked at her down there—her private areas—and that the doctor felt everything down there, and went inside,” Claire recounted. “The reason why she was concerned about getting the doctor’s germs was that the doctor wasn’t wearing gloves.” Then a daughter sitting next to them heard that and said, “Yeah, they did that to me, too.” It got worse. Another daughter, who was a year at the time, was crying and screaming during her medical exam. “They took ropes and tied her feet down to the bed, and then did the exam,” Claire explained. An “adversary hearing” took place on Sept. 7. No matter how the hearing turns out, getting out of the Lone Star State is on their agenda. “We are leaving. We are surely leaving,” said William. “Absolutely, without a doubt,” Claire confirmed. This is the second state to “supposedly” victimize this family. When they come under investigation for neglecting them, they move! They were not taken because the parents wanted to home-school them, they were taken because their living conditions were unsanitary, because they were seen eating out of a dumpster, and because a toddler was left sleeping in a closet. Still doesn’t answer the question about the nasty birthing pool with aged placena in it or putting a toddler in a closet to sleep while they went to the doctor. That’s not made up crap. I will find the news link and post it later. The Rembis’s stayed with me for two weeks. #1. They regularly took their children to the dentist and have those records showing that. Their Dentist told Mrs. Rembis that the younger children (Under 6) will lose their baby teeth and there is no sense in doing extensive expensive repairs until they get their adult teeth, if it should still warrant repair, then they will address that then. #2. They were also advised by their children’s doctor, not to vaccinate the children as a few of them had very bad reactions to the vaccines – this is also in their medical records. #3. The Social worker hell bent on ripping this family apart – Kristin Stecklien – tried to get them for educational neglect last June/July, stating in court that Mrs. Rembis supposedly home schools, yet she never saw any school material. As anyone with children well knows, the Nations children are out of school for the summer months for summer break, so of course there wouldn’t be school materials just lying about. #4. When the youngest child had wandered outside and the police were called, the officer that responded told Mrs. Rembis he would not be involving CPS, and advised them to secure their garage. The reporting party (a meth head) didn’t like his response and took it upon herself to call cps in herself. #5. Kristin Stecklien also perjured herself three times in court – intentionally giving false information against the Rembis family, claiming that they would not allow her to see the children or to enter their home. The Rembis’s (as well as many other families) have been advised not to allow CPS into their homes because they will make crap up about people in order to take their children and put them into State care. However; the Rembis’s went against this advice and allowed Stecklien into their home anyway, and allowed her to interview their children. They video taped this and can prove that Stecklien lied about not being allowed contact. Stecklien also stated she was concerned that the Rembis’s didn’t have any beds for the kids (in court) however, on her initial contact with the Rembis’s, Stecklien only was concerned about the baby not having a crib, and supplied the Rembis’s with a crib. Nothing about the other children having beds was mentioned until court. The Rembis’s were in the process of moving into their new home in Lubbock and had not gotten all of their furniture out of Storage in Plano yet, if Stecklien was so concerned about them not having furniture, then why didn’t she and her department help them get their stuff from Plano to their new home in Lubbock, instead of trying to paint them as parents to poor and neglectful to provide beds and furniture for their home? That would be doing their job correctly, they don’t get any money for that, so don’t do it. I work with over 1,500 families across the U.S. in nearly all 50 States, and they can all tell you similar stories about CPS and how they rail road families to take their children all for the Federal IVe & Ve funding. Can you cite some evidence for this? Even Establishment reports do not mention any of this. And yet there was a birthing pool In their bedroom with aged placenta floating in it, parents admitted to leaving a sleeping toddler locked in a closet, and the kids teeth are so rotted it will take thousands of dollars to fix!? You people! Yes there is corruption but wake up! This is so wrong. All of DFPS deserves to be behind bars due to the organization’s history. If anything, the Rembis family is guilty of not having the correct garage door protection. you need to send this story to Glenn Beck. Somebody needs to sue the pants off of these rogue agencies and the bureaucrats in their personal capacities. Enough of this terrorism against innocent families!